Is there really anything more breathtaking to photograph than the joy and wonder of bringing new life into the world? Physically, emotionally, and pragmatically your world will shift focus, and there will always be special memories marking the transition from before to after this new soul came along. With newborns, change happens daily, right before your eyes. You will never regret creating a beautiful keepsake of how her tiny body fit right in your hands, how her big brother would sing to her when she cried. I work with newborns and their families either in the studio, or in your home. In either location, my style is natural and only lightly posed. Pictures with parents and siblings are always part of the session. For a STUDIO SESSSION, we will capture those beautiful, sleepy baby portraits that make wonderful art for your walls or baby announcements. I do not use many props, but I will provide all of the wraps, hats, and blankets needed. I also keep a nice warm studio which is the key to a sleepy and happy baby! In the HOME SESSION, we will take a lifestyle approach, focusing on mom and dad interacting and bonding with their new baby. This is a beautiful way to tell the story of your new family life, and can even include some neat activities like nursing sessions, sink baths, walks, or other parts of your new routine. I believe in printed photographs, which is why I include prints with every session. I know you will never regret having albums full of pictures ready to share, or art on your walls that makes you smile. I will help you sort through the proofs, select and pair the best images, and make your pictures a tangible heirloom the family can enjoy. Newborn sessions begin at $200, packages starting at $495. 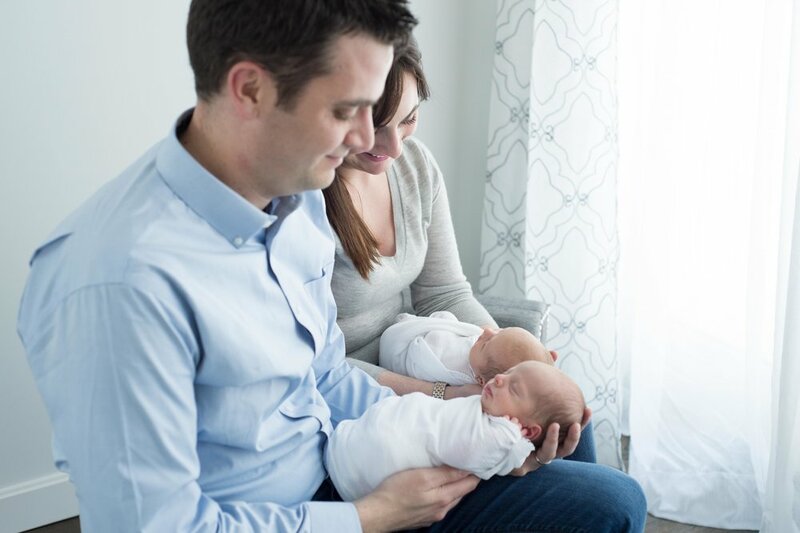 I also offer a think-of-everything first year package, which includes a maternity session, newborn session, birth announcements, and two mini-sessions with your baby during the first year.